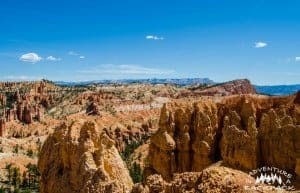 We arrived near Bryce Canyon National Park about halfway into National Park Week, and we were excited to get into the park and see what all it had to offer! After scouting some hikes out the day we came in, we decided on a more strenuous hike then we had been doing the last few weeks. 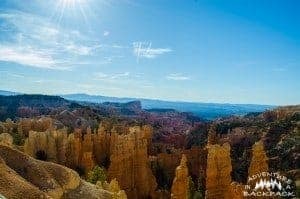 Fairyland Loop is an 8.1-mile loop trail inside Bryce Canyon National Park. We decided on this trail and prepared to head out first thing in the morning. Why Did We Choose the Fairyland Loop Trail? 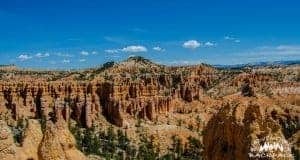 We decided on the Fairyland Loop Trail because the reviews about it were great and all of them mentioned that it was the least packed trail in Bryce Canyon National Park. We are all about meeting people, but we do not enjoy a crowded trail. It was also National Park Week, so we knew the park would be even more crowded than normal. So less people appealed to us on this one! We also were looking for a more strenuous trail, as the last time we hiked something strenuous was when we were in Colorado. We were itching for our quads and calves to BURN! It was also a longer trail, and we were ready to get out of the RV for a full day and enjoy the beautiful weather. All of these factors added up to Fairyland Loop Trail being our adventure for the day! How Strenuous is Fairyland Loop? Fairyland Loop is listed as a strenuous hike, both for the length (8.1 miles) as well as the elevation gain (1550 feet of elevation gain). The trail is a nice trail, well-packed and relatively smooth. The elevation change is mostly in ups and downs and not all at one time. The most strenuous part that we felt was the last about half mile, which was full of switchbacks and an uphill climb. Being at the end of the 8.1-mile hike, it was a bit tough. However, we would personally label this trail as moderate since most of the elevation change is pretty gradual. The difficulty of this trail will be a direct representation of your fitness level. If you regularly practice covering large distances in short times by foot, this will be easy. If you are a bit overweight and don’t normally engage in physical activity, this will be strenuous. Which Direction Should You Hike Fairyland Loop? When we researched Fairyland Loop, we found many reviews stating that it is best to hike in a counter-clockwise direction because then you would hike the Rim Trail at the end, which is a less strenuous “cool-down.” Upon hiking this trail in a counter-clockwise direction, we came to the conclusion that those reviewers must have been starting from Sunrise Point rather than the actual Fairyland Loop trailhead. Because if you start from Fairyland Loop trailhead and travel counter-clockwise, you do the Rim Trail first and then come to Sunrise Point. So, that being said, I think either direction would be fine, and although we had a steep climb at the end, both directions would have been relatively steep at the end. #Adventure! How Hard is it to Navigate Fairyland Loop? The Fairyland Loop trail is very well-marked. It is always advised to have a trail map handy for reference, but this one is pretty straightforward in case you don’t have one. There are signs at every intersection directing you to the correct trail. The trail is very well-marked and a well-packed trail, so it is never ambiguous where you should be headed. Fun Facts about Fairyland Loop! 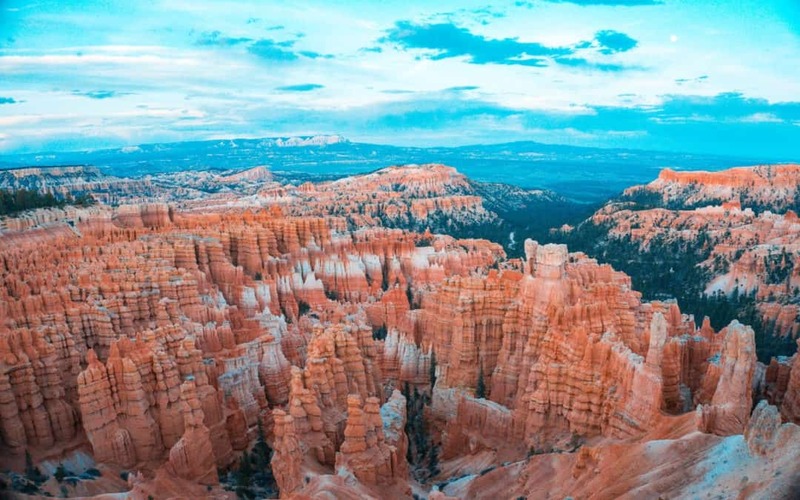 Bryce Canyon National Park is most famous for its hoodoos in the canyons. Hoodoos are the pinnacle/finger-looking sandstones protruding up out of the ground. The fields of them look crazy! The hoodoos here used to be part of the plateau and have eroded out over the years to be individual landforms. The sandstone in Bryce Canyon National Park is very flaky and erodes quickly. 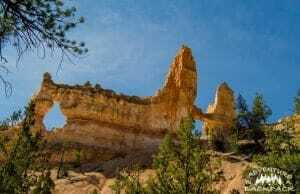 There is no climbing in the park due to how unstable the rock is; it wouldn’t hold your body weight on the hoodoos! Another fun fact is that about 4.0 miles into the trail (if traveling counter-clockwise coming from Fairyland Loop Trailhead), there is a slight diversion from the trail to the Tower Bridge. This is a natural land bridge formed out of the sandstone. Typically, pictures don’t do landforms justice, but in this case we were surprised at how small Tower Bridge actually was! It looked much bigger in pictures! That may have just been our perception after having visited Natural Bridges National Monument and seeing the massive land bridges there, though. How Would We Rate the Fairyland Loop Trail? The Fairyland Loop Trail rated four stars from us. It was a beautiful trail with great scenery. The trail did not disappoint on that front! Although it was listed as strenuous, and it did admittedly get us breathing hard, the elevation change was gradual versus very steep and sudden. I guess we are too used to Colorado hikes where the elevation change is all-or-nothing! So we would rate it moderate. And finally, there were still more people on the trail than we would have liked. It was not crowded by any means, but we did find it difficult to get to a point where we could not see or hear anyone else on the trail. When we are out enjoying nature, we don’t love listening to other conversations of fellow hikers. So all of that considered, we still highly enjoyed the Fairyland Loop Trail, but we had to knock off a star for the downsides of the trail. I guess we can’t win them all with perfect hikes!